Spruce-Pine-Fir (also referred to as SPF) are three different kinds of B.C. softwood species. They share very similar qualities, durabilities and strengths, which is why the three are often grouped and sold together. There is very little difference between a piece of spruce and one of pine or fir. SPF is used extensively by builders and the construction industry for structural framing of new homes and buildings. The wood holds nails and screws tightly, is easy to work with and versatile for painting or staining purposes. 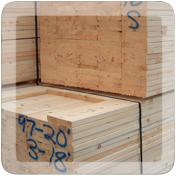 Spruce-Pine-Fir wood is colored white or pale yellow. SPF's most popular use is for the construction of homes and structural lumber. Excellent for machinists to shape into furniture and panelling.